Coach Placement strategy is one of the most important parts of your business to understand because it can have a huge impact on both you and your coaches’ success. Please be sure you have an understanding of coach placement BEFORE you sign up your first coach!! I advocate a “Far and Wide” coach placement strategy. In other words, you always want to build the outside legs of you and your coaches. The benefit of the Far and Wide Strategy is that each Personally Sponsored Coach that you sign up will have a strong outside leg contributing volume which will help them cycle more as they work to build their inside (weak) leg. If every coach uses the same strategy, the whole team benefits and every coach is in a “good spot”. The job of a new coach, as they grow their team and downline, is to build their inside leg to cycle and take advantage of all the volume points on their outside leg. **Update — the info that follows below will help you set your preferred placement in a custom manner, and it’s what we ALL used to have to do. But in July 2013 Beachbody set a default placement that exactly mirrors the “far and wide” technique I advocate. To set your placement this way, go to the Coach Online Office, click “My Business” — “My Preferred Placement”, and then change the POSITION tab to “Weak/Outside Leg”. This will set the default to put your first coach on the weak leg, the second on the strong leg (to help you go Emerald), and then will put future coaches on the outside of whichever leg has the lowest volume (thus always building your cycle bonus potential to it’s max). This is GREAT for all new coaches so set it this way! As you build a larger team, you’ll want to learn more about custom placement, which I will now explain. In order to be sure your coaches are placed in the spot you want, you need to have your PREFERRED PLACEMENT set up correctly. A couple things you will notice in this picture. Derek is in my downline, but he wasn’t sponsored by me. There is no “PS” (personally sponsored) notice above his head. Scott and the other coach on my right leg ARE personally sponsored. All coaches (whether PS or not) contribute equally to our volume and bonuses, but only PS coaches contribute to rank (see more about rank in the “Ranks” tab). 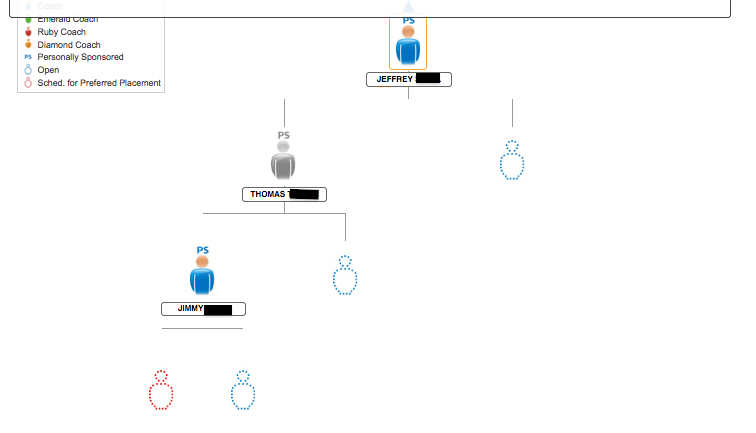 Also, you’ll notice that Derek is active (he’s blue), and Scott is inactive (he’s grey). When I go to set my preferred placement, if I want the coach to go on my left leg, I will click the link above my head that says “Go To Bottom Left”. Similarly, if I want the coach to go on my right leg, I will click the link above my head that says “Go To Bottom Right”. Once I’m there, I will see the little blue dotted guys. I will click on the one I want to set as my preferred placement and it will turn red. A red dotted guy means the next coach I sign up will go there. In the photo above, I want to put my next coach on my LEFT leg, so I went to “Bottom Left” and then clicked on the farthest down, farthest left option (which is now RED). With the Far and Wide placement strategy, it doesn’t matter if the coaches are PS or not. The strategy is the same. ALWAYS PLACE COACHES IN THE FARTHEST DOWN, FARTHEST OUTSIDE POSITION of the leg you want them on. To become Emerald, you have to have a PERSONALLY SPONSORED coach on each leg. 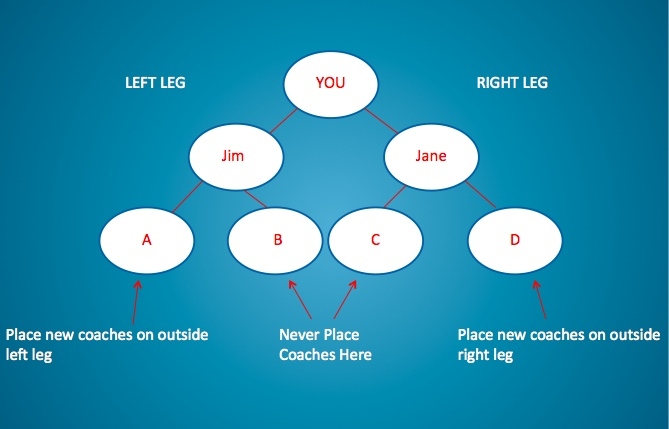 To be diamond, you have to have a PS emerald coach on each leg and 3 other PS coaches on each leg. 1st PS coach goes on the weak leg. 2nd PS coach goes on the strong leg — you become emerald. 3rd, 4th, 5th coach go on weak leg (to build up the weak leg, leading to better cycle bonuses). 6th, 7th, 8th coach go on strong leg (so that you have enough coaches on the right to become diamond as soon as one of your coaches on each leg becomes emerald). 9th coach and all others afterwards should go on the weak leg to build it. There are some exceptions = If coaches are sitting inactive, you can’t count them and will have to add active coaches to make up for them. If you become diamond and want a little extra security, you’ll want to place another coach or 2 on the strong leg just to protect yourself from losing your diamond ranking should a coach drop out. And as you start to shoot for multiple stars and multiple business centers, we will need to talk strategy so let me know as you get to that point. **NOTE = If you happen to have a coach sign up suddenly and they are in the wrong position, you have 3 days (72 hours) to contact Coach Relations and change their position. Email Coach Relations at coachrelations@teambeachbody.com and tell them your name and ID #, the name and ID # of the coach that just signed up, the name and ID # of the coach you want to place them under, and then the position (right or left).